I want you to stay. I want you to hear it. 2. Look through the chapter up to the moment when Poirot and Dr. Sheppard came to see Flora. Charles spent a lot of money at the bar. Who do you think he took money from? Charles Kent came to the bar at a quarter to 10. It means that he had an alibi, doesn’t it? But why did Poirot not recommend to set him free? What evidence was the possible time of the murder based on? Did Flora really see her uncle at a quarter to 10? What did the experiment made by Poirot help to prove? What conclusion can we draw? 3. Be a detective and try to make an inference (логический вывод): Why did Flora lie to everybody that she saw her uncle that evening? 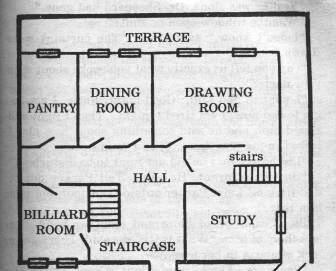 The layout of the rooms on the ground floor helps you to explain. Mind that the bedroom was upstairs. 4. Translate the paragraph where Poirot explains HIS idea to Dr. Sheppard. 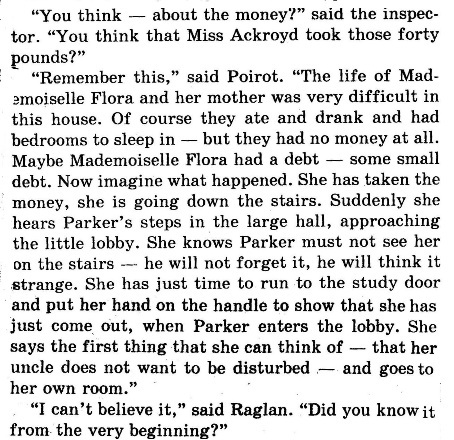 Who took 40 pounds according to Poirot? Why? She didn't see her uncle that evening. She didn't see her uncle at a quarter to 10. The murder may have been commited earlier. 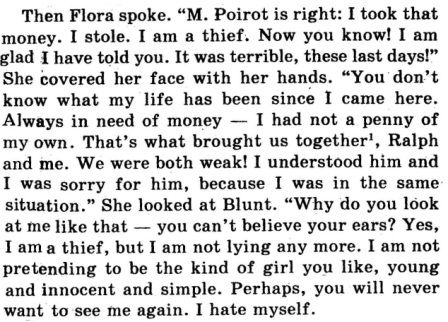 What two facts did Flora hide from Poirot? She took 40 pounds from the bedroom. She knows where Ralph is. She doesn't love Ralph Paton. It is important! Did you understand if Flora loved Ralph? Did you guess who she loved?